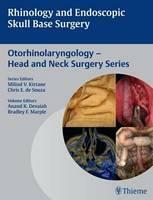 This hardback volume on rhinology and endoscopic skull base surgery forms part of a larger series of six otolaryngology books produced by the well-known publisher Thieme. This particular volume exemplifies the principle of this series of volumes by providing a clear, up-to-date and concise source of information for the reader. This book is produced by a largely, but not exclusively, North American team of contributors. It is neatly divided into 3 main sections consisting of 36 chapters. Section 1, approximately 30 pages in length, is dedicated to some basic scientific principles of rhinology, such as embryology, anatomy and physiology. It also includes a nice chapter on imaging, with examples of computed tomography, magnetic resonance imaging, positron emission tomography and three-dimensional techniques. Section 2 covers some more traditional and well-known aspects of rhinology and sinus surgery over its 100 pages. These include welcome chapters on medical treatments, fungal sinus disease, facial pain and balloon sinuplasty, providing a balanced opinion on the latter. Technical chapters cover details of surgery, from aesthetic rhinoplasty through standard septal surgery to endoscopic sinus surgery. The practical chapter on the management of epistaxis will be welcomed by trainee readers. Discussion chapters on powered instruments, paediatric sinus disease and complications complete this section. The final section (120 pages) covers more complex aspects of endoscopic skull base surgery, highlighting the many varied approaches that are currently available. These include orbital decompression, cerebrospinal fluid leak repair, and benign and malignant disease, and there are chapters dedicated to specific conditions such as juvenile nasopharyngeal angiofibroma and nasopharyngeal carcinoma. Chapters on radiotherapy techniques and robotics will be less familiar to many ENT surgeons, but are clearly areas of great technological progress for the future. Overall, this is indeed a concise and therefore practically useful textbook. It has a nice balance of text and images (mainly clinical photos), most of which are of excellent quality. All chapters follow a logical sequence of sections throughout, but lack the commonly used bullet-point boxes or ‘top tip’ formats that others frequently adopt. I don’t feel, however, that this detracts in any way from the book, as the chapters are short and to the point. The other five titles in this series are: ‘Pediatric Otorhinolaryngology: Diagnosis and Treatment’, ‘A Multidisciplinary Approach to Head and Neck Neoplasms’, ‘Head and Neck Surgery’, ‘Otology and Neurotology’ and ‘Laryngology’.